We’ve also seen two new papers come out, both including Nigel, in fact. The first of these describes ‘Clarity‘, an open-source program to manage lab automation that he worked on with Jose Rojas Echenique. We’ve used this to run our automated, robotic growth analysis system, but it could be applied to any given automation challenge. 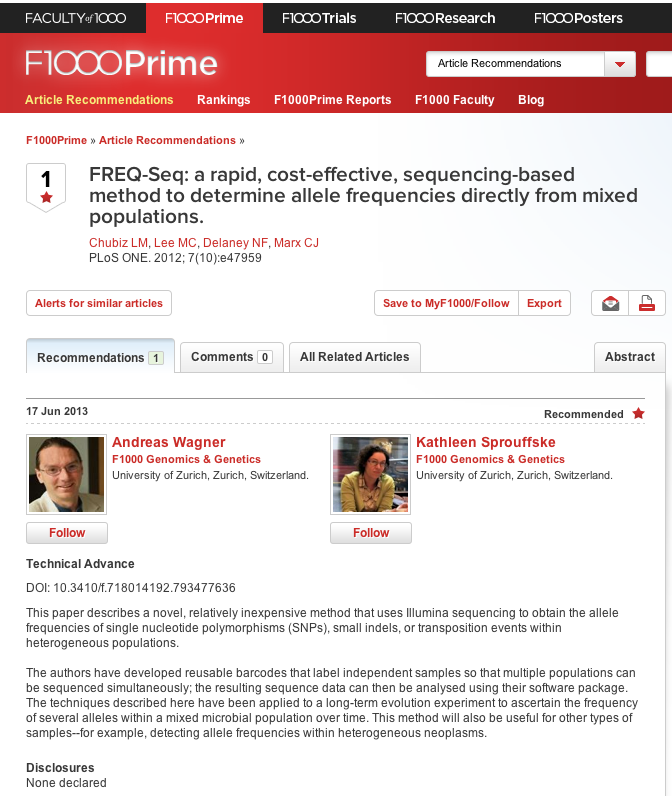 Second, we have published a paper describing ‘FREQ-Seq’, a new method to rapidly determine allele frequencies directly from mixed populations. Developed by Lon Chubiz and Miki Lee, this is an efficient way to barcode samples and shine the light of Illumina sequencing on just known sites of interest, thereby generating phenomenal depth of coverage (~150,000x for 100 samples in 3% of a lane) and avoiding any typical Illumina library prep. The bridging primers with barcodes for this can be regenerated from a panel of plasmids available through the non-profit plasmid distribution organization, Addgene.org. Nigel developed a software program, ‘FREQout‘, that allows users to rapidly extract frequency information from the Illumina data. We sent this to Yousif Shamoo’s lab for testing and they’ve completed all the data they needed for part of their paper in press at PNAS in the very first go. 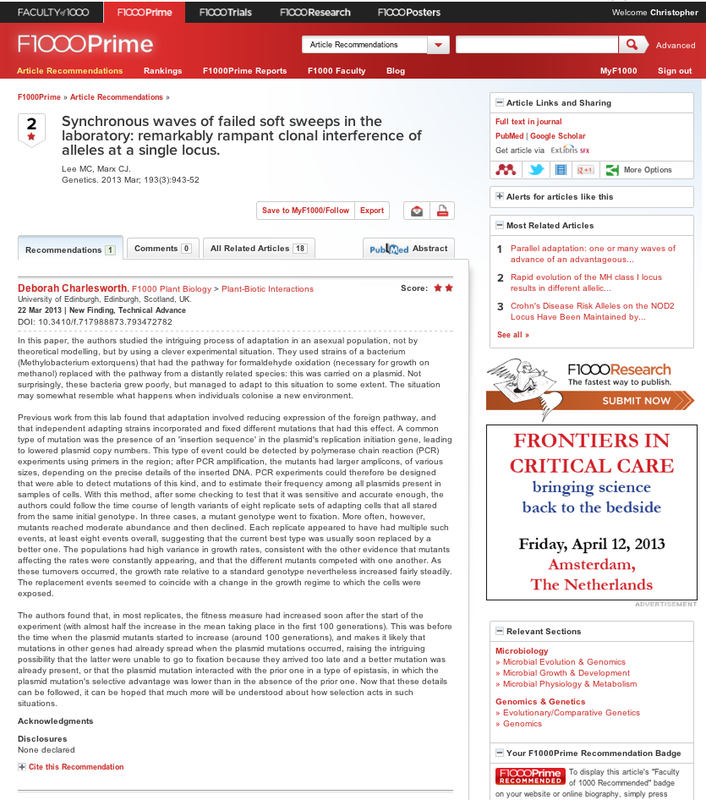 This entry was posted in publications, research on December 7, 2012 by cmarx2014. In the past month and a half we’ve had four new papers come out. 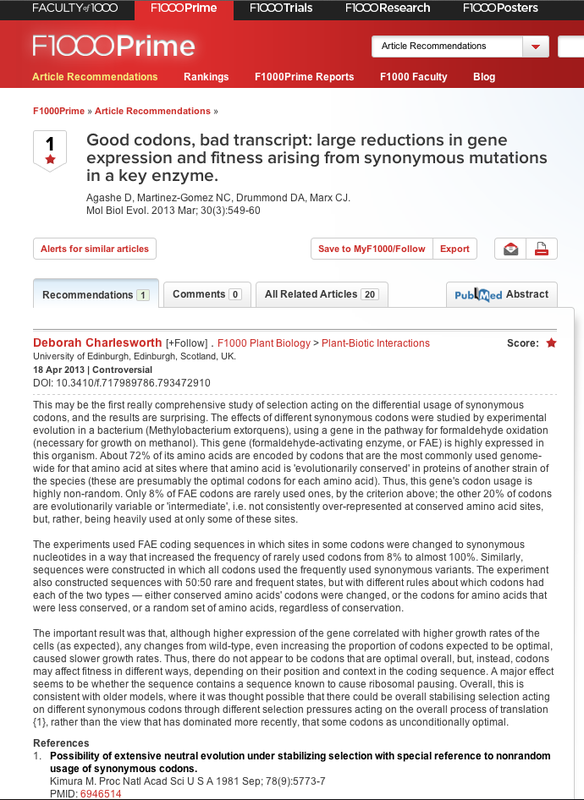 First is one led by myself and Stephane Vuilleumier in Journal of Bacteriology announcing the genome sequences of six strains of Methylobacterium. Second, Hsuan-Chao Chiu, his then-mentor Daniel Segre and I have a follow-up to last year’s Science paper in Proceedings of the Royal Society B that extends some general theory that considers how epistasis arises from the dependence of fitness upon underlying traits. Third, David Robinson and Miki Lee (former undergrad and grad student, respectively) led a paper that came out in Nucleic Acids Research describing a new program (OASIS) for automated annotation of transposable elements from genome sequences and some surprising findings regarding their distribution. Finally, Nick Leiby and Will Harcombe worked to report in BMC Evolutionary Biology that a few of the Lenski long-term E. colipopulations have become dependent upon citrate for growth on glucose. This entry was posted in publications, research on September 4, 2012 by cmarx2014. Comings and Goings, Grants, and Publications. In the midst of a busy summer, we have had some comings, goings, new grant, and a new paper. We welcome Sherif Gerges as a visiting summer undergrad and Josh Michener as a new postdoc, fresh off his Caltech Ph.D. Unfortunately we had to give our best wishes to a few departing lab members: postdocs Jessi Purswani (headed back to Valencia for a postdoc) and Alex Bradley (starting off his new lab at Wash. U. ), and lab manager/technician extraordinaire Maryska Kaczmarek (heading off to study Evolution for her Ph.D. at UT Austin). Speaking of UT Austin, a proposal led by Claus Wilke to the Army Research Office there has been awarded. His lab, ours, and six others are looking to see if we can make a statistical association between growth conditions and cellular composition. Should be a fun challenge! Finally, a new paper of mine has been accepted that describes an accidental, surprising finding of mine a few years ago. Some of the replicate populations I initiated didn’t grow to full density from single colonies that I used to start each one, and they started to crash. Most of them recovered after a few cycles but one population remained alive but >100 times lower density than the others. It turns out that it specifically adapted to life at low density and lost fitness at standard densities. This entry was posted in publications, research on July 12, 2012 by cmarx2014.